Fluoride has been added to drinking water since the 1960s. Currently, approximately 70% of the U.S. population is exposed to fluoride added to their drinking water for the purposes of improving dental health. This is done because it has been believed that fluoride strengthens teeth. New evidence shows that the entire belief that fluoride strengthens teeth was perpetrated by the founder of one of the largest U.S. aluminum manufacturing companies. 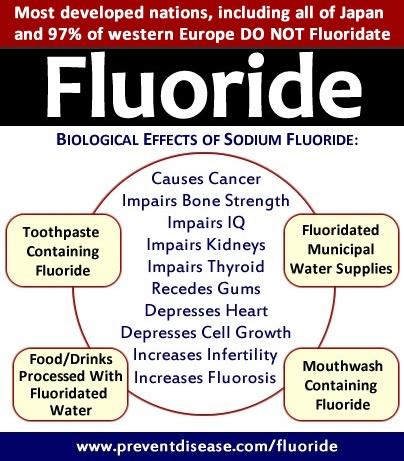 These types of companies, along with manufacturers of certain types of fertilizer produce large amounts of fluoride (considered a toxic substance in this form) as a by product. This toxic by product had to be specially disposed of. This process of disposal costs large amounts of money for these industries that produce it. After the U.S. congress was convinced that fluoride was beneficial for teeth, it was convinced that it should be added to the water supply of U.S. cities. This new policy enabled these companies who previously paid large sums to dispose of this toxic waste to now be handsomely paid by U.S. cities to add it to the water supply. It has been well known for years that fluoride in this form damages bones, can cause certain types of cancer, and actually makes teeth more brittle. It also dramatically increases aluminum uptake to the brain which has been associated–along with mercury–with Alzheimer’s disease. Should I be concerned about the use of fluoride? If the ADA recommends fluoride, it must be good . . . NOT. The Fluoride Debate , is a juxtaposition of the arguments presented by the American Dental Association (ADA) withcomments from many of the independent scientists who have examined the issue with an open mind. Fluorosis is a cosmetic condition that affects the teeth. It is caused by overexposure to fluoride during the first eight years of life. This is the time when most permanent teeth are being formed. Fluorosis first attracted attention in the early 20th century. Researchers were surprised by the high prevalence of what was called “Colorado Brown Stain” on the teeth of native-born residents of Colorado Springs. The stains were caused by high levels of fluoride in the local water supply. 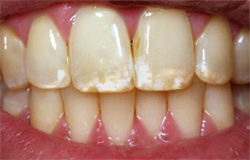 People with these stains also had an unusually high resistance to dental cavities. This sparked a movement to introduce fluoride into public water supplies at a level that could prevent cavities but without causing fluorosis. Questionable. The enamel shows slight changes ranging from a few white flecks to occasional white spots. Very mild. Small opaque paper-white areas are scattered over less than 25% of the tooth surface. Mild. White opaque areas on the surface are more extensive but still affect less than 50% of the surface. Moderate. White opaque areas affect more than 50% of the enamel surface. Severe. All enamel surfaces are affected. The teeth also have pitting that may be discrete or may run together. Fluorosis affects nearly one in every four Americans ages 6 to 49. It’s most prevalent in those ages 12 to 15. The vast majority of cases are mild, and only about 2% are considered “moderate.” Less than 1% of cases are “severe.” The prevalence of fluorosis in children ages 12 to 15, however, has increased since the mid-1980s. Although fluorosis is not a disease, its effects can be psychologically distressing and difficult to treat. Parental vigilance can play an important role in preventing fluorosis. Using fluoride-containing dental products such as toothpaste and mouth rinses inappropriately, or some argue, using these dental products at all. Children enjoy the taste of fluoridated toothpaste so much that often they swallow it instead of spitting it out. Taking a higher-than-prescribed amount of a fluoride supplement during early childhood can cause it. So can taking a fluoride supplement when fluoridated drinking water or fluoride-fortified fruit juices and soft drink already provide the right amount. Drinking tap water and especially mixing formula or juice with tap water is a major source of fluoride in children, in communities where drinking water is fluoridated. Prompted by concerns that children may be getting too much fluoride, the Health and Human Services Department in January 2011 lowered its recommended level of fluoride in drinking water. And the Environmental Protection Agency is reviewing its rules on the upper limit of fluoride levels in drinking water. How can you prevent fluorosis? 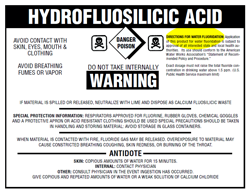 Choosing dental products without fluoride present, or if choosing products which contain fluoride, supervising their use to assure products are spit out and not swallowed. If your water comes from a public system, your doctor or dentist — as well as your local water authority or public health department — can tell you how much fluoride is in it. If you rely on well water or bottled water, your public health department or a local laboratory can analyze its fluoride content. Once you know how much fluoride your child is getting from drinking water and other sources such as fruit juices and soft drinks, you can work with your dentist to decide whether or not your child should have a fluoride supplement. 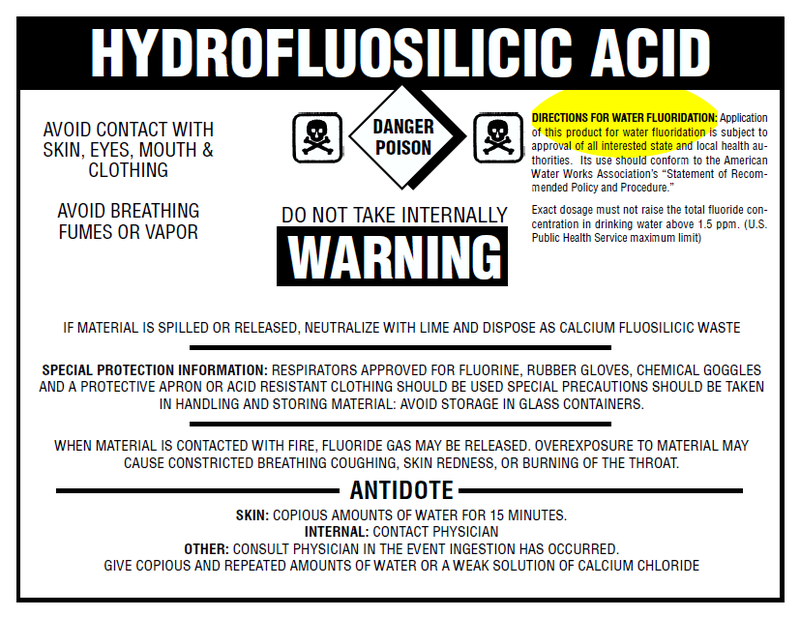 If you have products containing fluoride in the house, keep them out of the reach of children. Contact your dentist if you notice that your child’s teeth have white streaks or spots or if you observe one or more discolored teeth. In many cases, fluorosis is so mild that no treatment is needed. Or, it may only affect the back teeth where it can’t be seen.